No soldier who took part in the two day’s engagement at Shiloh ever spoiled for a fight again. We wanted a square, stand-up fight and got all we wanted of it. 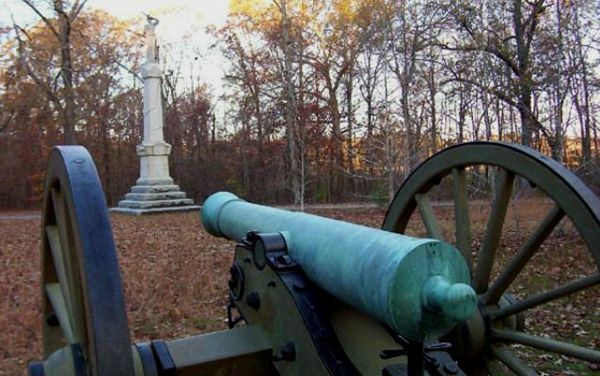 The Shiloh National Military Park, established on December 27, 1894, not only preserves the site of the bloody Battle of Shiloh in April 1862; but, also the siege, battle, and occupation of the key railroad junction at nearby Corinth, Mississippi. The park also includes the Shiloh National Cemetery, which contains around 4,000 soldiers and their family members, and the Shiloh Indian Mounds, a National Historic Landmark in its own right. 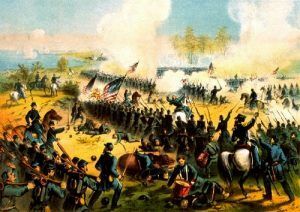 Battle of Shiloh (April 6-7, 1862) – Also called the Battle of Pittsburg Landing, this battle took place in Hardin County, Tennessee. By mid-February, 1862, Union forces had won decisive victories in the West at Mill Springs, Kentucky, and Forts Henry and Donelson in Tennessee. These successes opened the way for invasion up the Tennessee River to sever Confederate rail communications along the important Memphis & Charleston and Mobile & Ohio railroads. Forced to abandon Kentucky and Middle Tennessee, General Albert Sidney Johnston, supreme Confederate commander in the West, moved to protect his rail communications by concentrating his scattered forces around the small town of Corinth in northeast Mississippi where the strategic crossroads of the Memphis & Charleston and the Mobile & Ohio Railroads sat. In March, Major General Henry W. Halleck, commanding U.S. forces in the West, advanced armies under Major Generals Ulysses S. Grant and Don Carlos Buell southward to sever the Southern railroads. Grant ascended the Tennessee River by steamboat, disembarking his Army of the Tennessee at Pittsburg Landing, 22 miles northeast of Corinth. There, he established a base of operations on a plateau west of the river, with his forward camps posted two miles inland around a log church called Shiloh Meeting House. Halleck had specifically instructed Grant not to engage the Confederates until he had been reinforced by Buell’s Army of the Ohio, then marching overland from Nashville. Once combined, the two armies would advance on Corinth and permanently break western Confederate railroad communications. General Johnston, aware of the Federal designs on Corinth, planned to smash Grant’s army at Pittsburg Landing before Buell arrived. He placed his troops in motion on April 3, 1862, but, heavy rain and difficulties encountered by marching large columns of men, artillery, and heavy wagons over muddy roads, delayed the attack. By nightfall on April 5th, his Army of the Mississippi, nearly 44,000 men present for duty, was finally deployed for battle four miles southwest of Pittsburg Landing. At daybreak, on Sunday, April 6th, the Confederates stormed out of the woods and assailed the forward Federal camps around Shiloh Church. 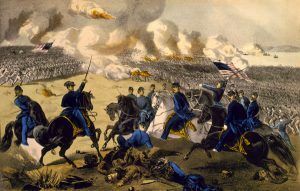 Grant and his nearly 40,000 men present for duty were surprised by the onslaught. The Federals soon rallied, however, and bitter fighting consumed “Shiloh Hill.” Throughout the morning, Confederate brigades slowly gained ground, forcing Grant’s troops to give way, grudgingly, to fight a succession of defensive stands at Shiloh Church, the Peach Orchard, Water Oaks Pond, and within an impenetrable oak thicket that battle survivors named the Hornets’ Nest. Despite having achieved surprise, Johnston’s troops soon became as disorganized as the Federals. The Southern attack lost coordination as corps, divisions, and brigades became entangled. Then, in mid-afternoon, as he supervised an assault on the Union left, Johnston was struck in the right leg by a stray bullet and bled to death, leaving General P.G.T. Beauregard in command of the Confederate army. Grant’s battered divisions retired to a strong position extending west from Pittsburg Landing where massed artillery and rugged ravines protected their front and flanks. Fighting ended at nightfall. Overnight, reinforcements from Buell’s Union army reached Pittsburg Landing. Beauregard, unaware Buell had arrived, planned to finish the destruction of Grant the next day. At dawn on April 7th, however, it was Grant who attacked. Throughout the day, the combined Union armies, numbering over 54,500 men, hammered Beauregard’s depleted ranks, now mustering barely 34,000 troops. Despite mounting desperate counterattacks, the exhausted Confederates could not stem the increasingly stronger Federal tide. Forced back to Shiloh Church, Beauregard skillfully withdrew his outnumbered command and returned to Corinth. The battered Federals did not press the pursuit. The Battle of Shiloh, or Pittsburg Landing, was over. It had cost both sides a combined total of 23,746 men killed, wounded, or missing — more casualties than America had suffered in all previous wars — and ultimate control of Corinth’s railroad junction remained in doubt. Major General Henry W. Halleck, recognizing Corinth’s military value, considered its capture more important than the destruction of Confederate armies. Reinforced by another army under General John Pope, he cautiously advanced southward from Tennessee and, by late May, entrenched his three armies within cannon range of Confederate fortifications defending the strategic crossroads. Despite being reinforced by Major General Earl Van Dorn’s Trans-Mississippi Army, Beauregard withdrew south to Tupelo, Mississippi, abandoning the most viable line of east-west rail communications in the western Confederacy. Federal efforts to recover the Mississippi Valley stalled in the late summer of 1862 and Confederate leaders launched counteroffensives in every theater. Armies led by Generals Braxton Bragg and Edmund Kirby Smith invaded Kentucky, while troops under General Van Dorn boldly attacked the heavily fortified Union garrison at Corinth, “linchpin” of Federal control in northern Mississippi. In one of the more bitterly contested battles of the war, Van Dorn was decisively repulsed, following two days of carnage on October 3-4, 1862 that claimed nearly 7,000 more Confederate and Union casualties. Although overshadowed by the failure of Robert E. Lee’s Confederate invasion in Maryland, Van Dorn’s defeat, coupled with Bragg’s retreat from Kentucky after the Battle of Perryville on October 8, 1862, caused discouragement in Richmond, Virginia and relief in Washington. More significantly, Van Dorn’s defeat at Corinth — the last Confederate offensive in Mississippi — seriously weakened the only mobile Southern army defending the Mississippi Valley. This permitted Major General Ulysses S. Grant to launch a relentless nine-month campaign to capture “the fortress city” of Vicksburg and recover the Mississippi River. 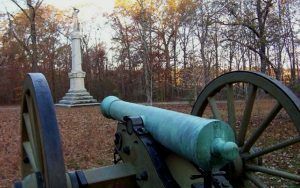 Of the many separate skirmishes that took place within the greater Battle of Shiloh, the best known is that of the Hornet’s Nest. Ranking with Pickett’s Charge at Gettysburg, Bloody Lane at Antietam, and the Stone Wall at Fredericksburg, Shiloh’s Hornet’s Nest is well known to even the most amateur of Civil War buffs. Lying in the center of Shiloh Battlefield, this was the scene of heavy combat on both days of the battle. On the first day, elements of three Union divisions manned the line along a little-used farm road that ran through the J.R. Duncan land. Duncan and his family worked a small cotton field that bordered the road to the south. With its open fields of fire and road cover, there is little wonder that the Duncan plot became one of the most important localities on the battlefield. 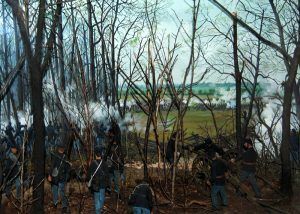 Heavy fighting raged in the area of the Hornet’s Nest on the first day, with no less than eight distinct Confederate attacks turned back by the determined defenders. Confederates so named the location because, they said, the enemy’s bullets sounded like swarms of angry hornets.